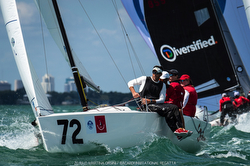 J/News Articles: Bacardi J/70 Series Gets CATAPULT’ed! Bacardi J/70 Series Gets CATAPULT’ed! (Miami, FL)- Thirty-seven J/70 teams from ten nations (USA, Argentina, Italy, Monaco, Brazil, Great Britain, Chile, Germany, Canada, and Mexico) sailed the third and final series of the Bacardi J/70 Winter Series- the Bacardi Invitational- this past weekend in simply stellar weather conditions for all three days. Coral Reef YC hosted the event, in coordination with Biscayne Bay YC, and the combined PRO’s managed to run eight races, much to the delight of the sailors. A stellar fleet was assembled for the event, following on the previous week’s J/70 Midwinter Championship that was hosted in the same venue. In the end, it was Joel Ronning’s crew on CATAPULT from Lake Minnetonka, Minnesota that won, with crew of Victor Diaz de Leon, Patrick Wilson, and Chris Stocke. It was a very difficult regatta strategically and tactically for many of the top teams in the J/70 fleet. Here is how it all went down over the three-day series. It was one amazing sailing day in Biscayne Bay, with typical Miami winter conditions of strong breeze, sunshine and small chop. 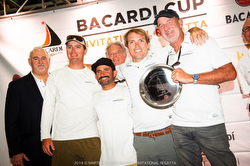 Racing didn’t get better for the 165 teams racing at the Bacardi Invitational Regatta. Three races were wrapped up for the J/70 fleet. Three different teams won races and it wasn’t easy task to grab victory amongst such super competitive talent. Owner-driver Carlo Alberini on CALVI NETWORK controlled the leaderboard with scores of 2-6-1 and sat on a 3 point advantage over SURGE (USA) helmed by Ryan McKillen with World Champion tactician Mark Mendelblatt. Two points behind in third was Monaco’s G-SPOTTINO driven by Giangiacomo Serena di Lapigio. Miami and the South Florida woke up under a cloudy sky with the wind blowing vigorously at 15 to 18 knots from the East/North East. 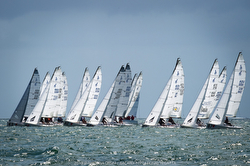 All races started on schedule at 1100 hours across the different race courses on Biscayne Bay. Three races were wrapped up for the J/70s. Tough and close battles unfolded on the J/70 course, with the top two teams separated by just four points. Italy’s CALVI NETWORK lost their overnight lead after mistakes in their gennaker drop at one leeward gate rounding, giving the opportunity for CATAPULT (driven by Minnesota’s Joel Ronning) to break away into the top spot. But, with two races on Saturday the game was still wide open. SURGE dropped to third place, and was an 11-point deficit to second. 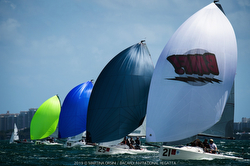 Miami and Biscayne Bay today showcased the best day of racing as this iconic racing venue said good-bye to the 500 sailors who competed at the Bacardi Invitational Regatta. A great Easterly breeze of around 10 knots, sun shining, warm, and wave chop a lot less than the previous days, made for a perfect race day. All of the classes finished their scheduled races. In the J/70s, the winners were the team on CATAPULT, featuring Joel Ronning, Victor Diaz del Leon, Patrick Wilson and Chris Stoke. They were the most solid and consistent of the fleet with every score inside the top 3, after discarding their 11th in race 3. 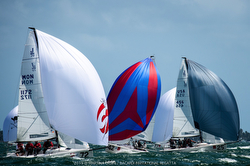 They racked up a 16 point advantage over second placed Americans onboard McKillen’s SURGE with Mark Mendelblatt calling tactics along with Jon Wallace and Sam Loughborough. Then, in third was Italy’s CALVI NETWORK with Carlo Alberini driving with crew of Stefano Cherin, Jas Farneti, and Marco Furlan. Rounding out the top five was Will Welles’ SCAMP in fourth with crew of Zeke Horowitz, Jake Doyle, and Reed Baldridge. Fifth was the Mexican team on WOODSTOCK, skippered by Fernando Gutierrez, with crew of Willem van Waay, Javier Gutierrez, and Leopoldo Turco. “This was a very fun team to sail with we all got along very well,” commented Ronning on their win with Team CATAPULT. “This group of people is very good at what they do. We had tremendous fun; we were able to minimize mistakes by keeping the dialogue open and if there were any issues they were taken care of right away. It’s a phenomenal event and one of the premier series in the world. It’s very well organized. We love Shake A Leg, we love Bacardi, everybody is so welcoming and we will definitely be coming back.” For more Bacardi Cup J/70 Winter Series sailing information Add to Flipboard Magazine. J/70 Sevastopol International Cup Announcement! ROSEBUD Tops San Diego NOOD Regatta! Not Fake News! BAD NEWS Wins J/22 Midwinters! J/145 KATARA Flying Across the Caribbean! Gorgeous Bahia de Banderas Bay Regatta! Celebrate International Women’s Sailing Day! Honoring Paul Heys of J/U.K. Women's J/22 Winter Regatta in Sunny SD!